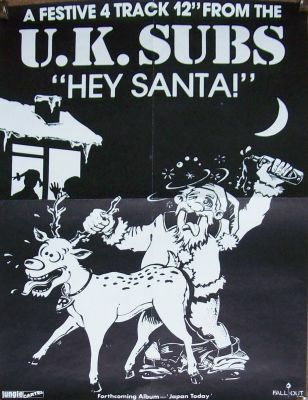 "Never mind your Ho Ho Ho"
Above: Hey Santa UK release, 1987, front & back cover. Click to enlarge. This release featured four tracks lifted straight off the Japan Today LP, with the title track being a version of the Australian comedian Kevin 'Bloody' Wilson's Hey Santa Claus. Alongside this was a version of the theme tune to the 1960s TV programme Captain Scarlet (Credited as Barry Green but actually written by Barry Gray), with an arrangement of the traditional song Thunderbird on the flip side - with the only original Harper composition, Street Legal. It was also the first release on Fall-Out since the band had left the label in 1985. 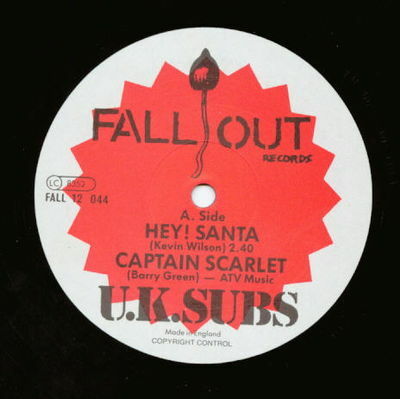 "The Christmas record to end all Christmas records, this little cracker is the sort of truly disgusting meat headed Punk Rock record that sadly doesn't get made anymore.....Charlie Harper's merry men aren't the sort of people you'd want to share your mulled cider with but every truly first rate Punk band deserves at least one moment of glory and this moment belongs to the U.K.Subs. Lord knows they've earned it"
The artwork on the reverse of the sleeve is printed the opposite way up to the front. Some copies are missing the 12 prefix on the cat number in the run-out grooves (see above). A big thank you to Jeff Hultgren for the additional info. 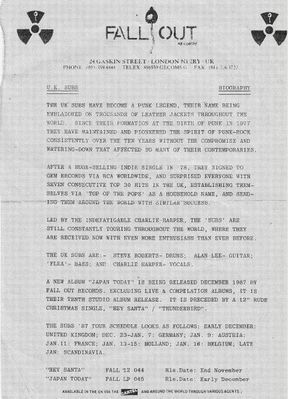 Above: Japan Today / Hey Santa Fall Out press release. Above: Press ad, unknown origin. Image courtesy of Paul Mileman.